No one is sick but I don’t like freezing much, so after the duck, comes the soup. I still had both carcasses, the wings, and necks so I cooked them in the pressure cooker with a clove garlic to get some broth and many scrapes of meat. No fat left at this point, so no need to degrease, just put the sliced meat back in. Next, I added the finely chopped beet and turnip leaves (but other greens are fine) and two green onions, half a cup of cilantro, 1 tsp grated fresh ginger, a fresh clove, a star anise, a spoon of tomato paste, a sprinkle of hot sauce, Japanese Udon noodles and the leftover of jus from the Cherry duck* from yesterday to simmer five minutes. Squeeze in half a lime’s juice when serving and use the other half to cut slices to decorate. Poor in a bowl over a handful of fresh bean sprouts. I know, not much to it, I guess it is the cook’s day off! 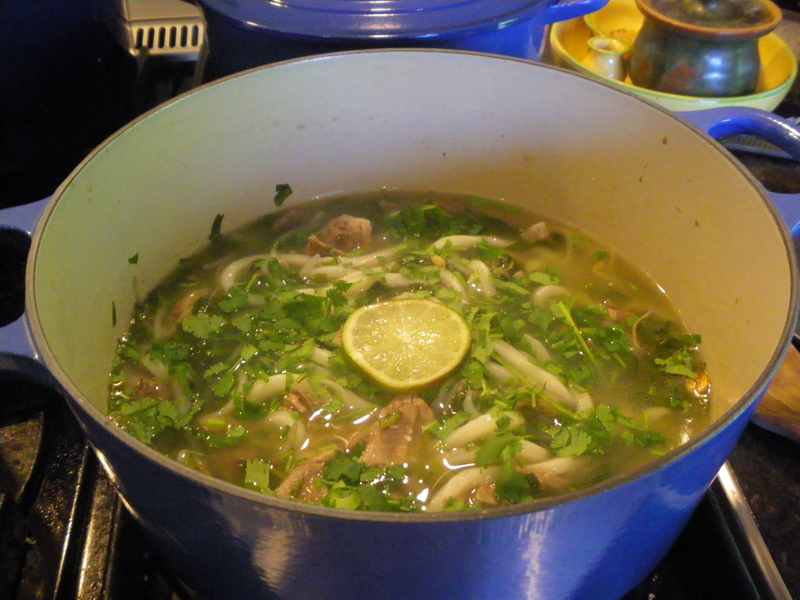 This entry was posted in Soup and tagged duck soup, food, health, nutrition, recipe, recipes, soup, udon noodle. Bookmark the permalink. Now I would welcome that on a cold January evening in Toronto! 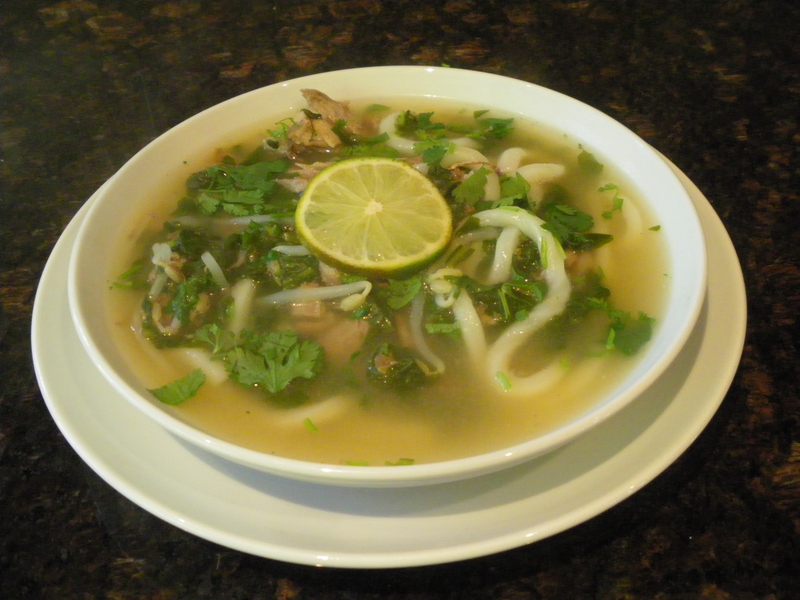 Looks very hearty and satisfying….love the use of udon noodles. I think I come to the right place. The duck noodle looks really delicious. This is the recipe that my family’s gonna love it. Isn’t fusion cooking great? You have taken a French-influenced dish and morphed it into west coast/Asian comfort food. It is the great thing, French one day, Asian the next, what a good left-over cover up! Did not fool the husband though! Is this the left-over duck, he asked cleverly. But once over the deception, went on to eat with such enthusiasm, you would have never thought he had duck the day before.